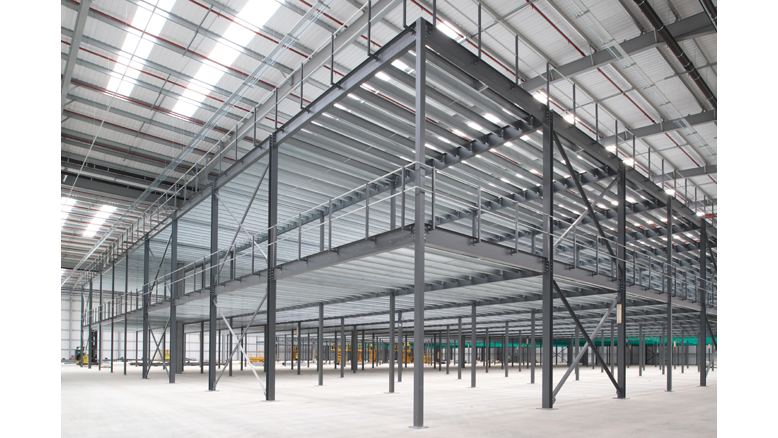 The construction of a massive new warehousing facility in Northampton has involved Hadley Group supplying unusually large quantities of its UltraMezzTM components to long-term customer Mezzanine International, with Hadley Group also supporting the successful erection programme throughout. The two-tier mezzanine structure will provide Decathlon Distribution – a German based sports goods supplier – with some 17,000 square metres of space for storage and racking; and is the latest landmark project undertaken by the mezzanine flooring supplier and manufacturer during an eight-year relationship. Kent-based Mezzanine International, which is active throughout the multi-channel retail, E-fulfilment, office development and other sectors, first tendered to Decathlon’s construction arm, ABK, for the contract in December 2016. Hadley Group responded to the scale of the work with a competitive price and reacted immediately when the work was awarded earlier this summer. Beginning during the first week of August, Hadley Group has made weekly deliveries to the site on Thomas Dascher Way, keeping Mezzanine International’s team of two supervisors and up to 15 sub-contract operatives supplied with C-section joists, cleats and other custom formed components. DesignSuite Pro is an intuitive and customisable software package that supports the design and specification of projects based on Hadley Group’s cold rolled, high strength, lightweight UltraZed purlins and UltraBeam side rails and floor beams making project planning and specifying easier than ever before. “The mezzanine rises 4.2 metres to the first level and 8.4 metres to the second. A big advantage of using the C-section joists is that our installers can hang them on the cleats as they bolt them up. Everything is rolled to order and pre-punched as necessary for fixings. Progress has been very good and we are expecting to complete two weeks ahead of schedule on a 10 week programme,” Andy Parsons continued. While similar mezzanines would normally be completed with the application of an intumescent paint system and non-combustible boarding beneath the decking, the Decathlon Distribution vinyl- coated decking construction and its conveyor belts are to be protected with a full sprinkler system. Going on to talk about other recent successes for the partnership, Andy Parsons added: “We have worked with Hadley Group on a number of high profile projects including a large warehouse for speciality drinks to store wine and other lines, and new distribution facilities for Amazon at Warrington, Bolton and Tilbury. All of these contracts involved very high loading requirements, for which we specified our Mezz-7 system. This involves Hadley Group supplying its B-Deck to support the main floor – making the installation seven times stronger than a standard mezzanine. Hadley Group’s UltraMezzTM selection of components can facilitate the rapid and cost-effective erection of mezzanine floors for both new-build and retrofit applications. Offering enhanced performance based on the manufacturer’s unique UltraSTEELTM process, the UltraMezzTM design and project management process cuts waste and avoids errors, while further support is available from Hadley Group’s technical sales team.